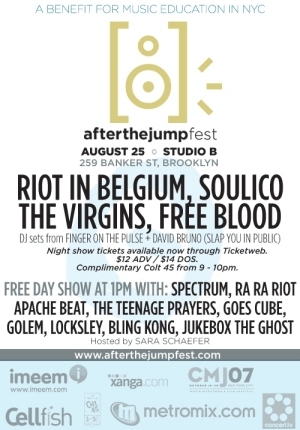 Call me crazy, but I’m giving away 5 pairs of tickets to the After The Jump Fest night show. Just email me here and tell me what Carl “A.C.” Newman and I have in common and you can win a pair of free tickets to the show featuring Riot In Belgium, Free Blood, Soulico and The Virgins. If you don’t know the answer, just guess, winners will be drawn at random. In other ATJF news, I just wanted to give a shout out to our excellent sponsors, without whom, none of this would have possible. Thanks again and big ups to them.